This is one of my favorite recipes to serve at Christmas. I know it is one of those old fashioned jello mold things but it looks just like a red wreath to me. I also just love cranberries and I have to sneak it in somehow. Stir boiling water into jello in large bowl 2 minutes or until completely dissolved. Stir in cold water and cinnamon. Pour 2 cups of the gelatin into a medium bowl. Refrigerate about 1 1/2 hours or until thickened (spoon drawn through leaves definite impression). Reserve remaining 1 cup jello at room temperature. 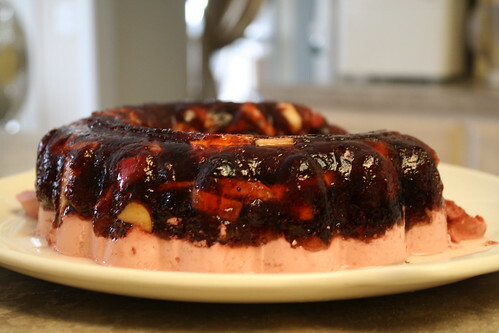 Stir apple and cranberry sauce into thickened jello. Spoon into 6 cup mold. Refrigerate 30 minutes or until set but not firm (should stick to finger when touched and should mound.) Stir reserved 1 cup jello gradually into cream cheese in small bowl with wire whisk until smooth. Put over jello layer in mold. Refrigerate 4 hours or until firm. Unmold. Posted on December 29, 2012 December 29, 2012 by cookingwithpizazzPosted in Holiday, SaladTagged Food, Holiday, Make Ahead, Recipe, Salad.